Let’s face it. The PC is still faster than the Web! Entering quick info on the PC, will be faster than loading a Web App like Google Calendar every time. I took a phone call today. I need to find a bit of info, and call the customer back tomorrow. So I set a quick reminder on my Calendar for 10am tomorrow to call. How do I get that to my phone? My phone is my essential reminder tool. I absolutely depend on the alarms there to remind me what to do throughout my day. The phone automatically synchronizes to Google. So it works fine if I made the appointment in Google. But I didn’t make the appointment in Google. To do that means launching my browser, log into Google, search for Calendar, decide which calendar, and then adding an entry. I don’t have time for that. The best way to go from Outlook to Google is CompanionLink for Google. It’s easy to set up, and completely automatic. I don’t even press a sync button. Just make the change in outlook, and it is automatically sent to Google. With CompanionLink, you don’t even need to open Google. When I make an appointment on the phone, it moves back to Outlook automatically. 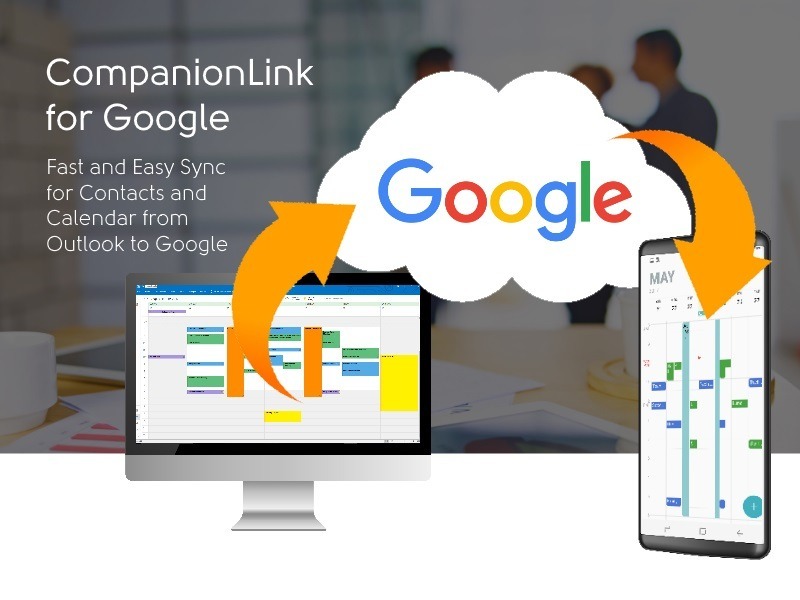 CompanionLink for Google is $49.95. Use the affinity code “BLOG” to get $10 off. You can download it right now and run a two-week trial. The trial has 100% of the features. Google Sync (the native sync to Android and iPhone) is great for Contacts and Calendar. If you also use Tasks, Category Colors, or Notes, then we recommend using a dedicated App on our phone called DejaOffice. Click on that link for more information. How to Connect Outlook 365 to Google for $5 per month, Contacts, Calendar and Tasks, without downloading anything! Office 365 Outlook is in the Cloud. Google is in the Cloud. So why don’t they connect? There’s no reason to download software and install it on your computer. If you need Outlook Cloud connected to Google Cloud, the service should be in the Cloud! CompanionLink provides an automated connection service from Microsoft Office 365 Outlook to Google. It synchronizes Contacts, Calendar and Tasks. You can set it up in about five minutes. It is free to set up. If you have under 400 records, it is free to use. FOREVER. If you have more records, we charge less than $5 per month. Just select a payment option as you set it up. 1. 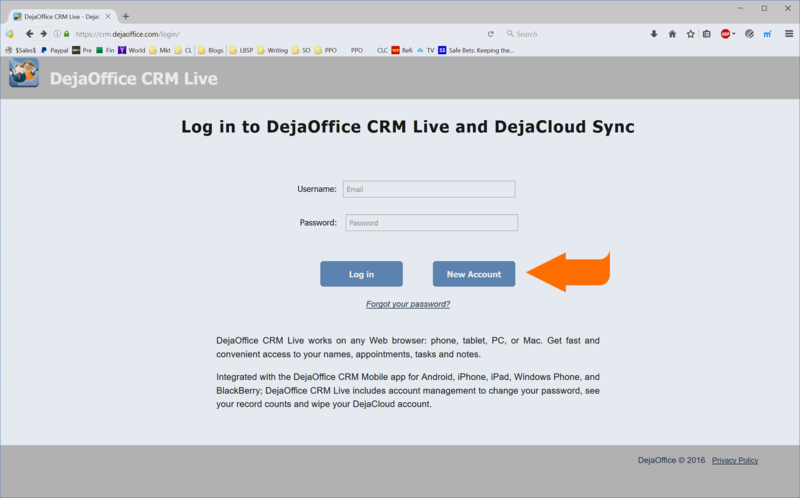 Create an account on DejaOffice CRM Live. 2.Select the “Settings” tab (the bottom one) . 4. If you have more have more than 400 records (contacts plus calendar),you will want to set up a payment option. Options are $14.95 for three months, or $99.95 for two years. That’s all! Once you have set up, your accounts should synchronize within about 15 minutes. They will continue to sync automatically. If you have any questions, you can call CompanionLink Support. They’ll help you out. On Android and iPhone set Google Sync. I love category colors. As a business person; green appointments mean money, red are urgent, yellow are cautious. I use purples and blues for personal and recreational stuff. When I glance at my day, or my week, it’s the colors that I see, not the text. We were “in the room” when Google created Google Calendar. That is; we were one of the companies chosen to see the “secret beta” back in 2006. This was months before the Calendar was available to the public. It was a lot of fun to go to Google’s campus and to get the secret information. What was not fun at all was understanding the level of inexperience Google had with PC office calendars. In 2006, PC Outlook had been out for nine years, Microsoft Schedule Plus for about nine years before that. Polaris Packrat was in full swing back in 1986, and in 1984 I remember Commence had a great Calendar for Windows. One would have thought that Google would take advantage of all these past Calendar products, and base their new offering on them. Nope! Google is a linux shop! Linux people always seem to want to create everything from scratch. So Google Calendar emerged with its own new way of handling recurring events, folders, and categories. It had few of the capabilities that PC calendars of that era offered. It was a huge up for them to climb to add revision after revision for things that everyone could already do 20 years before on PCs. One of those things is Category Colors. Outlook ties colors to different categories. So my business appointments are one color, and personal appointments are a different color. Google first tied colors to different calendars, and then added a secondary color attribute. CompanionLink for Google handles category colors well. If you need your Outlook colors on your Samsung Galaxy Phone, or your iPhone 7, then a great way to move them is with CompanionLink for Google. While Outlook associates colors with a Category, in Google it simply shows with a color “dot” on our main Google Calendar. If you want to see colors on your Android phone, or your iPhone, use the Google App on the phone. This will Google Sync from your Google Calendar, and it will include the colors. 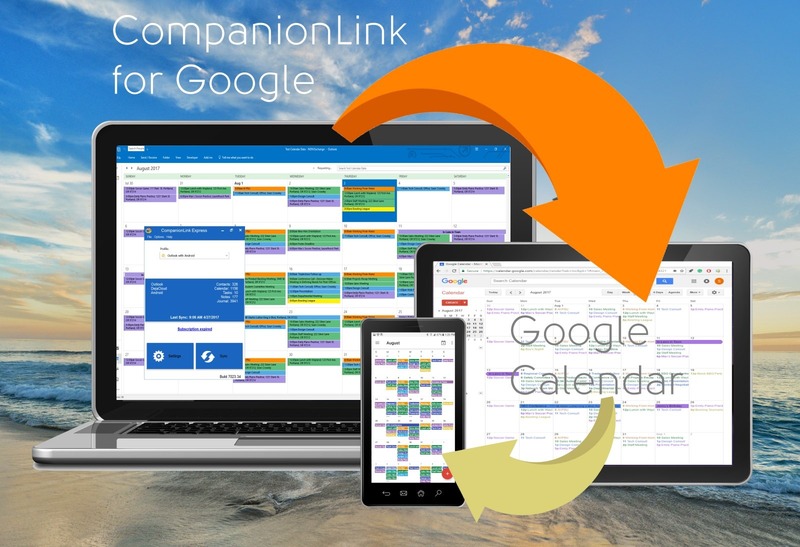 CompanionLink for Google is $49.95 and available for download now. You can get set up in about 15 minutes. Thanks for reading! This week brought us news of a clever phishing scheme using Google Docs. People received a realistic email from a trusted business associate. The email contained a link to a Google Doc. Opening the document required you go through Google OAuth and entering your Email and Password. Fortunately, Google OAuth is secure, so the password was not stolen. 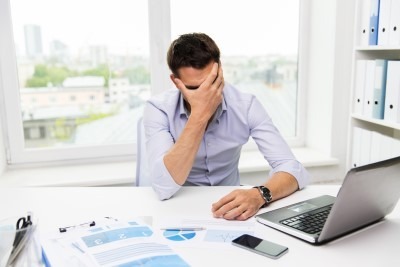 Unfortunately, the phisher obtained a token that allowed them to access your gmail account, allowing them to send an email to all of your professional contacts. This attack underscores a weak point in data security. When your email and contact information is stored on a public cloud server, the server becomes a target for obtaining your valuable information. Instead of targeting the billions of computers that are used to store business information locally, phishers target the “big three” who collect the data in complex systems that allow others access to it. Notwithstanding the phishing attack, Google, Microsoft and Apple reserve the right to farm your data and re-sell it. Google will scan your data and target advertising to you. If you send an email about an Acapulco vacation, you will soon find your browsing full of offers for cheap resorts. Microsoft and Apple are more circumspect about their data scanning. But they still store and mine the data, and work to derive profit from it. CompanionLink provides a secure alternative to storing your company’s data on a highly public server. If you use our USB, Wi-Fi, or Bluetooth Sync, your data is not stored at all. 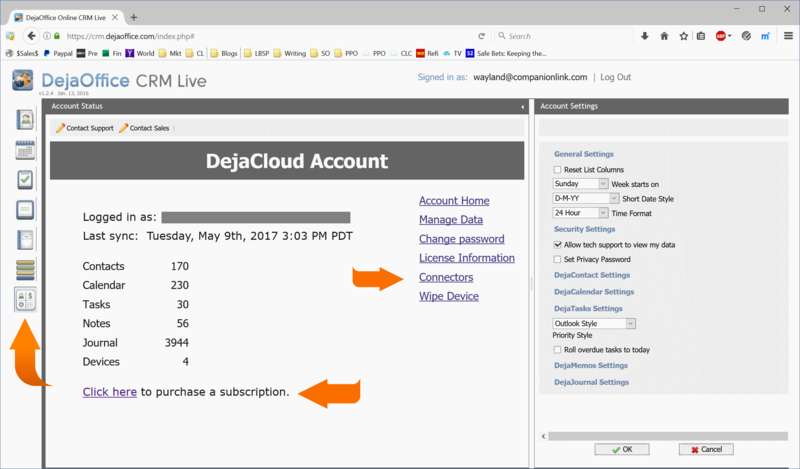 We offer a secure cloud service called DejaCloud. This service is significantly different from Exchange, iCloud and Google Sync. With DejaCloud, we do not derive income from mining and selling the data. Our source of income is product sales and subscription service, and that’s all. We are not a public company and do not have to split our loyalty between our customers and our shareholders. I remember years ago how proud I was as my customer list grew from 500 contacts, to 600, and then over one thousand. At that time I was using Goldmine, and we sold Add-On products for Act! and Goldmine. Today we have 1.8 million entries in our various databases, and I’m still proud that this list has never been hacked, and will never be stored in a public database. 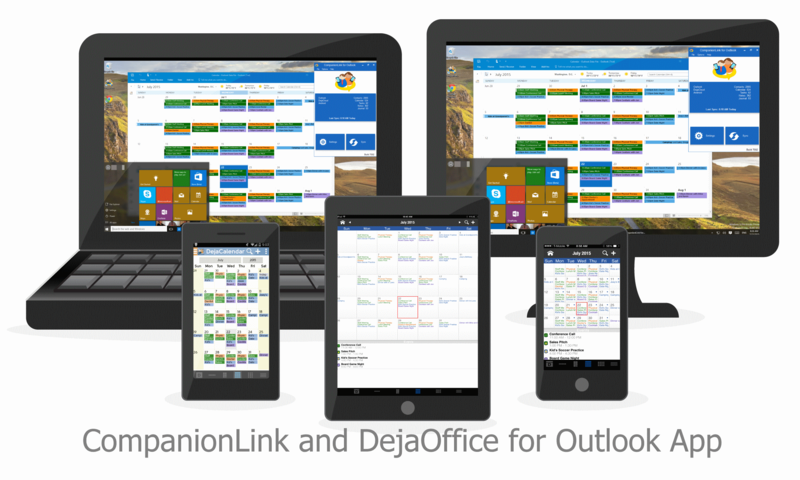 Download DejaOffice on your phone, and CompanionLink for Outlook on your PC. Watch your Outlook Contacts and Calendar appear on your phone. DejaOffice is Free. CompanionLink runs on a two-week trial. I think our Galaxy S8 and S8 Plus will be arriving tomorrow! Like many of you I can’t wait. I carried a Galaxy Note 7 for a month before it was recalled. The size and shape was really nice. Narrower and taller than my Galaxy Note 4, but very slim and nice to hold. I do a lot of business on my phone, emails, tasks, stocks, so I really like the large screen. Like most business people, I do nearly all my data entry on my desktop PC. That’s where I handle my task list, enter appointments, and add new contacts. If I’m out and about I use my phone to complete tasks, add new tasks and schedule things. So it’s a constant battle to keep my phone and my PC showing the same data. That battle is eliminated using CompanionLink and DejaOffice. 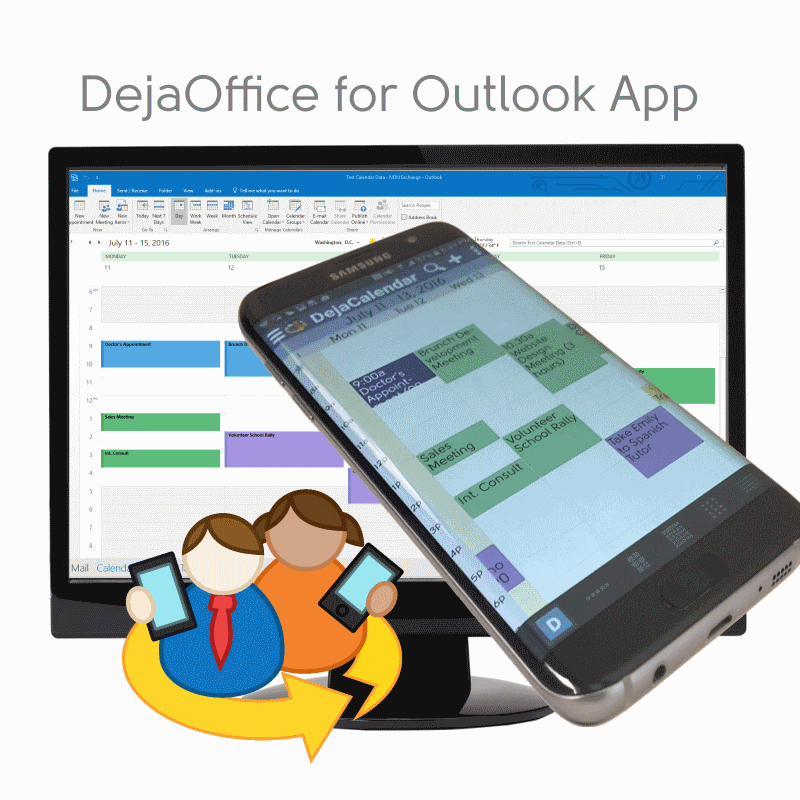 DejaOffice is hands-down the best Outlook-like App for the phone. It has the “classic 4”: Contacts, Calendar, Tasks and Memos, just like an old Palm OS device. More important, it has all the Outlook fields, and all the Outlook Calendar formations. Android OS comes from Google, which is a Linux shop. Even Google management does not use Outlook. It shows. You can’t schedule an appointment for every weekday in Android, and they don’t have a native task app. Works same on Android and iPhone, Phones and Tablets. 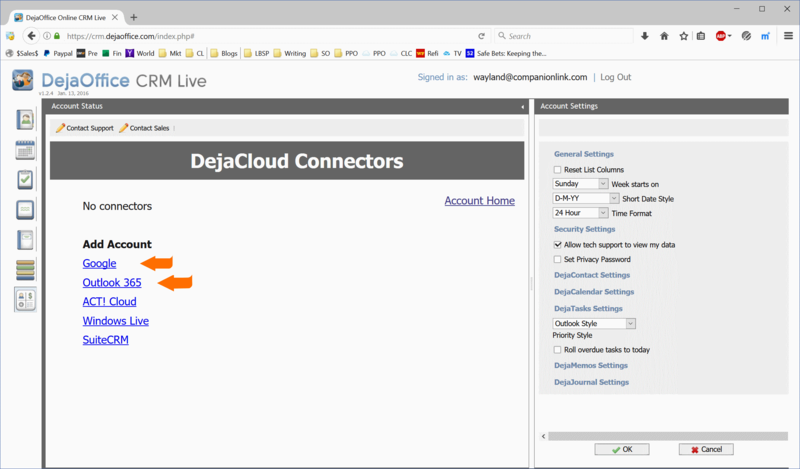 DejaOffice will connect to your PC using USB (remember old Hotsync? ), Wi-Fi, Bluetooth and DejaCloud. DejaCloud Realtime Sync is quick to set up and amazingly fast. I can make an appointment on my PC, and by the time I pick up my phone it is already there. It works when I’m on a trip without any problems. Let’s get started! It’s going to be a great year for phone releases. The print edition of The New York Times, page 89, featured CompanionLink! Wow! The article Keeping Your Android Files in Sync With a Computer mentions CompanionLink along with several free options like Google Sync (which does not sync to your PC) and DropBox which does not synchronize Contacts or Calendar. CompanionLink fully understands that not everyone is a technical genius, able to pull together multiple free solutions to make a seamless solution. Sometimes the best value in software tools is finding a tool that comes with the service needed to make it smooth and effortless. Many thanks to D.J. Biersdorfer for recognizing us in print! We got our Galaxy S7 Edge today. Nice phone. The graphics are great. The phone is light. The curved edges are awesome. 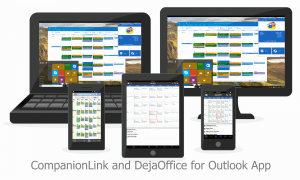 These large screen phablet phones are perfect for the DejaOffice for Outlook App. There’s a lot of useful space to do important things. The Google App and Outlook App both waste this space by using lots of white space. Our goal here at CompanionLink is to pack the space with data. The phone list on DejaOffice features your contact name, company name, email, phone number and category, and that’s just on the list. For tasks DejaOffice shows category, completed status, subject, due date, email or location. The Outlook App and Google App don’t even have tasks! That’s it! You’ll have your data on your phone. For more information here’s our info page for CompanionLink for Outlook. Call us at 503-243-3400 if you need further help. CompanionLink provides free technical support to everyone with a Galaxy S7 and Galaxy S7 Edge phone, regardless of whether you do or do not own a license to CompanionLink . You can also access our setup guides online. If you want an advanced configuration help, we offer a $49 RunStart package where our experts will log in to your PC and Galaxy S7 to configure the sync for you. This gives you the peace of mind that your Galaxy S7 Outlook sync is fine-tuned to match your needs. CompanionLink has an offer for people who have upgraded to El Capitan. Apple’s updates always seem to break old things. In this case, there are field reports that Exchange Contact and Calendar sync from Outlook for Mac 2011 is not working with El Capitan, Mac OS X 10.11. CompanionLink for Mac is working fine. So if you need your Contacts and Calendar updated in a jiffy, maybe it’s time to switch from Exchange sync to CompanionLink. We have two routes to do this. One is to install CompanionLink for Mac, and synchronize to Google, and set your iPhone, iPad or Android phone to sync with Google. This is a great solution if you only need Contacts and Calendar. 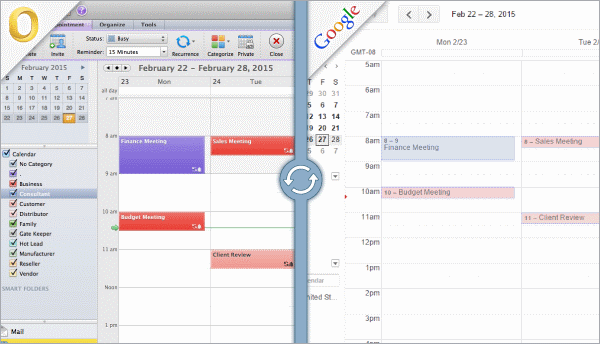 As you can see, Calendar colors are supported by CompanionLink’s Google Sync. 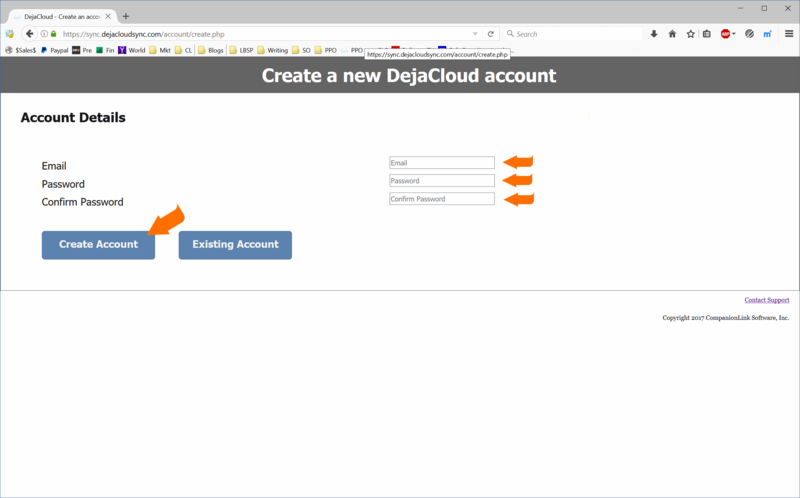 The better method is to download the DejaOffice for Outlook App onto your phone, and synchronize using DejaCloud sync. This is a direct sync from your Outlook for Mac 2011, and Outlook for Mac 2016 to DejaCloud and instantly to DejaOffice on your phone. DejaCloud sync handles Contacts, Calendar, Tasks and Notes. It handles your calendar colors. It has a lot of advanced features like templates that make adding new events and tasks ultra easy, and mapping capabilities to map nearby contacts and map your calendar events. Check it out! CompanionLink for Mac runs $49.95 and has a two week free trial. You can save $10 today by using the code “BLOG” in the Affinity Code field of your purchase, making CompanionLink for Mac just $39.95. Or for free, you can just start with the trial. Who knows, maybe Apple will fix the El Capitan problem in the next two weeks! There seems no end to sync solutions for iPhone. The problem is; they all devolve into Apple-like simplicity. Face it. We use Outlook because it is fast, effective, and the whole world supports it. It is forced on us by our business, it runs our mail, it runs our appointments, and the less time we can spend there, the more we can do our jobs. With iPhone, the best known solutions are feeble, at best. With Apple iCloud, you need to create a different Outlook folder and move your data to it. You need to put up with problems with it, with mail and other things. And then, when it gets to iPhone, you have no Tasks any more just reminders. With Office 365 and the Outlook App you have a different set of problems. It all gets to the phone ok (except for tasks again) but the only thing that is marginally good with the Outlook App from Microsoft is the email. Hello Microsoft: Email is NOT a problem on the iPhone. So that’s what CompanionLink and DejaOffice are here to do. Synchronize Outlook Contacts, and Outlook Calendar, and Outlook Tasks to the iPhone. Not only to move them, safely and securely, but DejaOffice provides an Outlook-like ecosystem on the iPhone and Android so that you can continue to do Contacts, Calendar, Tasks and Notes just like your PC. So if you want to schedule an appointment, or make a task for a contact, you can do that in one App on your phone. 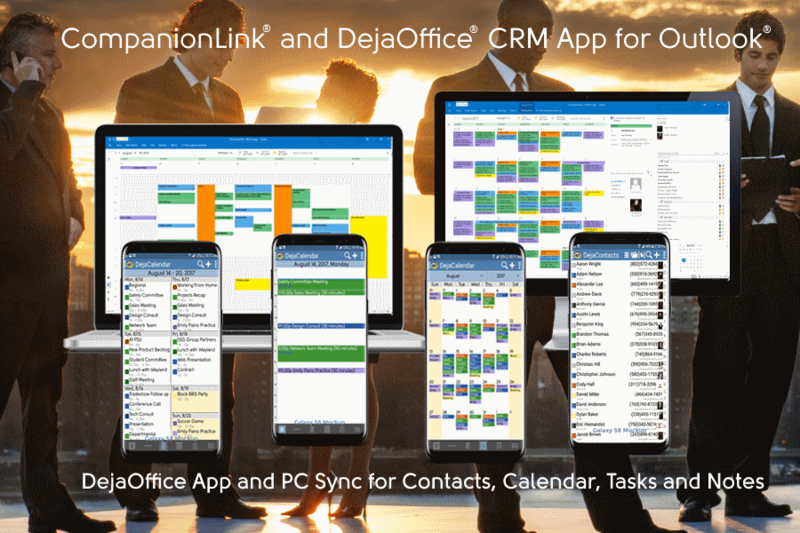 If you have Recurring Tasks, CompanionLink and DejaOffice is the only solution available that supports them on all platforms. CompanionLink also works for Outlook for Mac 2011 and Outlook for Mac 2015. Galaxy Note 5 and Galaxy S6 Edge+ are the newest additions to the Wide World of Phablets. The Edge+ is the first Phablet phone to feature the curved edges which can show information while the phone is turned. * Category colors, use the same categories across all conduits. Install CompanionLink on your PC. Click here to download it. On your Galaxy Phone, launch the Google Play Store. Search for DejaOffice and install it. Configure CompanionLink. Your configuration steps will depend on the sync option listed above that you choose. With DejaCloud sync, the synchronization will begin automatically within a few minutes. If you selected USB, WiFi, or sync to Google, you need to click on the Sync button in CompanionLink on your PC to start the first sync. Call us at 503-243-3400 if you need further help. Support is free to everyone with a Galaxy S6 phone, regardless of whether you do or do not own a license to CompanionLink . You can also access our setup guides online. If you want an advanced configuration help, we offer a $49 RunStart package where our experts will log in to your PC and Galaxy S6 to configure the sync for you. This gives you the peace of mind that your Galaxy S6 to PC sync is fine-tuned to match your needs.